The ABC of Network Sharing – The Fundamentals (Part I). Up-to 50% of Sites in Mobile Networks captures no more than 10% of Mobile Service Revenues. The “Ugly” (cost) Tail of Cellular Networks can only be remedied by either removing sites (and thus low- or –no-profitable service) or by aggressive site sharing. 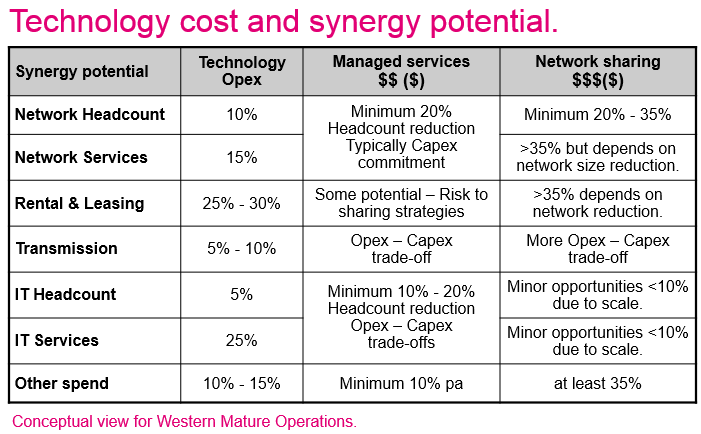 With Network Sharing expect up-to 35% saving on Technology Opex as well as future Opex avoidance. The resulting Technology Opex savings easily translates into a Corporate Opex saving of up-to 5% as well as future Opex avoidance. Active as well as Passive Network Sharing brings substantial Capex avoidance and improved sourcing economics by improved scale. National Roaming can be an alternative to Network Sharing in low traffic and less attractive areas. Capex attractive but a likely Ebitda-pressure point over time. “Sharing by Towerco” can be an alternative to Real Network Sharing. It is an attractive mean to Capex avoidance but is not Ebitda-friendly. Long-term commitments combined with Ebitda-risks makes it a strategy that should to be considered very carefully. Network Sharing frees up cash to be spend in other areas (e.g., customer acquisition). Network Sharing structured correctly can result in faster network deployment –> substantial time to market gains. Network Sharing provides substantially better network quality and capacity for a lot less cash (compared to standalone). Instant cell split option easy to realize by Network Sharing –> cost-efficient provision of network capacity. Network Sharing offers enhanced customer experience by improved coverage at less economics. Network Sharing can bring spectral efficiency gains of 10% or higher. The purpose of this story is to provide decision makers, analysts and general public with some simple rules that will allow them to understand Network Sharing and assess whether it is likely to be worthwhile to implement and of course successful in delivering the promise of higher financial and operational efficiency. Today’s Technology supports almost any network sharing scenario that can be thought of (or not). Financially & not to forget Strategically this is far from so obvious. Network Sharing is not only about Gains, its evil twin Loss is always present. Network Sharing is a great pre-cursor to consolidation. Network sharing has been the new and old black for many years. It is a fashion that that seems to stay and grow with and within the telecommunications industry. Not surprising as we shall see that one of the biggest financial efficiency levers are in the Technology Cost Structure. Technology wise there is no real stumbling blocks for even very aggressive network sharing maximizing the amount of system resources being shared, passive as well as active. The huge quantum-leap in availability of very high quality and affordable fiber optic connectivity in most mature markets, as well between many countries, have pushed the sharing boundaries into Core Network, Service Platforms and easily reaching into Billing & Policy Platforms with regulatory and law being the biggest blocking factor of Network-as-a-Service offerings. Below figure provides the anatomy of network sharing. It should of course be noted that also within each category several flavors of sharing is possible pending operator taste and regulatory possibilities. 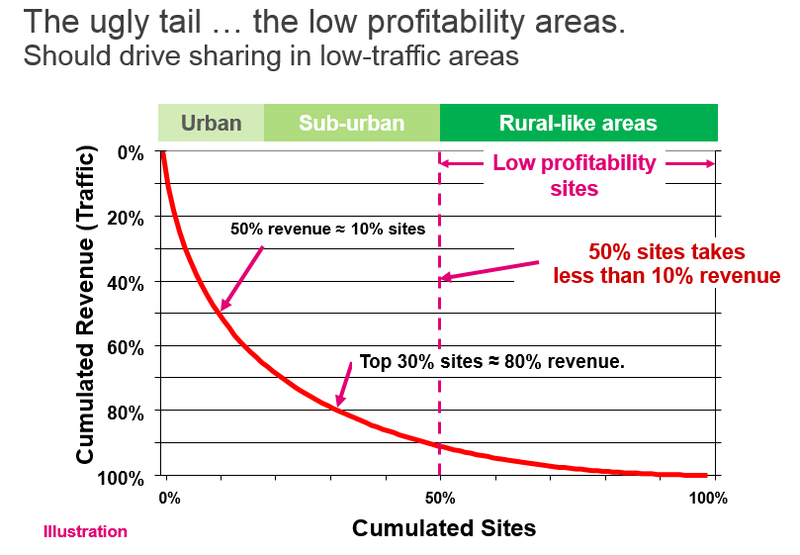 Capacity Limited Areas (dense urban and urban) – Site Sharing or Passive Sharing most attractive and sustainable. Coverage Limited Areas (i.e., some urban environments, mainly sub-urban and rural) – Minimum Passive Sharing should be pursued with RAN (Active) Sharing providing an additional economical advantage. Rural Areas – National Roaming or Full RAN sharing including frequency sharing (if regulatory permissible). One of the first network sharing deals I got involved in was back in mid-2001 in The Netherlands. This was at the time of the Mobile Industry’s first real cash crises. Just as we were about to launch this new exiting mobile standard (i.e., UMTS) that would bring Internet to the pockets of the masses. After having spend billions & billions of dollars (i.e., way too much of course) on high-frequency 2100MHz UMTS spectrum, all justified by an incredible optimistic (i.e., said in hindsight!) belief in the mobile internet business case, the industry could not afford to deploy the networks required to make our wishful thinking come true. T-Mobile (i.e., aka Ben BV) engaged with Orange (i.e., aka Dutchtone) in The Netherlands on what should have been a textbook example of the perfect network sharing arrangement. We made a great business case for a comprehensive network sharing. It made good financial and operational sense at the setup. At the time the sharing game was about Capex avoidance and trying to get the UMTS network rolled out as quickly as possible within very tight budgets imposed by our mother companies (i.e., Deutsche Telekom and France Telecom respectively). Two years down the road we revised our strategic thoughts on network sharing. We made another business case for why deploying on standalone made more sense than sharing. At that time the only thing T-we (Mobile NL) really could agree with Orange NL about was ancillary cabinet sharing and of course the underlying site sharing. Except for agreeing not to like the Joint Venture we created (i.e., RANN BV), all else were at odds, e.g., supplier strategy, degree of sharing, network vision, deployment pace, etc… Our respective deployment strategies had diverged so substantially from each other that sharing no longer was an option. Further, T-Mobile decided to rely on the ancillary cabinet we had in place for GSM –> so also no ancillary sharing. This was also at a time where cabinets and equipment took up a lot of space (i.e., do you still remember the first & 2nd generation 3G cabinets?). Many site locations simply could not sustain 2 GSM and 2 UMTS solutions. Our site demand went through the roof and pretty much killed the sharing case. Starting point: Site Sharing, Shared Built, Active RAN and transport sharing. Just before breakup I: Site Sharing, cabinet sharing if required, shared built where deployment plans overlapped. Just before breakup II:Crisis over and almost out. Cash and Capex was no longer as critical as it was at startup. It did not help that the Joint Venture RANN BV created to realize T-Mobile & Orange NL shared UMTS network plans frequently were at odds with both founding companies. Both entities still had their full engineering & planning departments including rollout departments (i.e., in effect we tried to coordinate across 3 rollout departments & 3 planning departments, 1 from T-Mobile, 1 from Orange and 1 from RANN BV … pretty silly! Right!). Eventually RANN BV was dissolved. The rest is history. Later T-Mobile NL acquired Orange NL and engaged in a very successful network consolidation (within time and money). The economical benefits of Sharing and Network Consolidation are pretty similar and follows pretty much the same recipe. Luckily (if Luck has anything to do with it?) since then there have been more successful sharing projects although the verdict is still out whether these constructs are long-lived or not and maybe also by what definition success is measured. Judging from the more than 34 Thousand views on my various public network sharing presentations, I have delivered around the world since 2008, there certainly seem to be a strong and persistent interest in the topic. Fundamentals of Mobile Network Sharing.(2012). Ultra-Efficient Network Factory: Network Sharing & other means to leapfrog operator efficiencies. (2012). Economics of Network Sharing. (2008). Technology Cost Optimization Strategies. (2009). Analyzing Business Models for Network Sharing Success. (2009). I have worked on Network Sharing and Cost Structure Engineering since the early days of 2001. Very initially focus was on UMTS deployments, the need and requirements to deploy much more cash efficient. Cash was a very scarce resource after the dot-com crash between 2000 & 2003. After 2004 the game changed to be an Opex Saving & Avoidance game to mitigate stagnating customer growth and revenue growth slow down. I have in detail studied many Network Sharing strategies, concepts and deals. A few have turned out successful (at least still alive & kicking) and many more un-successful (never made it beyond talk and analysis). One of the most substantial Network Sharing deals (arguable closer to network consolidation), I work on several years ago is still very much alive and kicking. That particular setup has been heralded as successful and a poster-boy example of the best of Network Sharing (or consolidation). However, by 2014 there has hardly been any sites taken out of operation (certainly no where close to the numbers we assumed and based our synergy savings on). More than 50% of all network related TCO comes from site-related operational and capital expenses. It is NOT enough to have a great network sharing plan. A very high degree of discipline and razor-sharp focus in project execution is crucial for delivering network sharing within money and time. With introduction of UMTS & Mobile Broadband the mobile operator’s margin & cash have come under increasing pressure (not helped by voice revenue decline & saturated markets). Technology addresses up-to 25% of a Mobile Operators Total Opex & more than 90% of the Capital Expenses. Radio Access Networks accounts easily for more than 50% of all Network Opex and Capex. For a reasonable efficient Telco Operation, Technology Cost is the most important lever to slow the business decline, improve financial results and return on investments. It is not by chance that RAN Sharing is such a hot topic. The Radio Access Network takes up more than half of Network Cost including Capex. Site acquisition (SA) & landlord relations (LR) – Standard practice for SA, not recommended for landlord relations. Usually better done by operator self (at least while important during deployment)..
Site Build – Standard practice with sub-contractors..
Network operations & Maintenance – Cyclic between in-source and outsource pending business cycle. Field services – standard practice particular in network sharing scenarios. Power management – particular interesting for network sharing scenarios with heavy reliance of diesel generators and fuel logistics (also synergetic with field services). Operational Planning – particular for comprehensive managed network services. Network Sharing could outsource RAN & TX Planning. Site leases – Have a site management company deal with site leases with a target to get them down with x% (they usually take a share of the reduced amount). Care should be taken not to jeopardize network sharing possibilities. Will impact landlord relations. IT operations – Cyclic between in-source and outsource pending business cycle. IT Development – Cyclic between in-source and outsource pending business cycle. 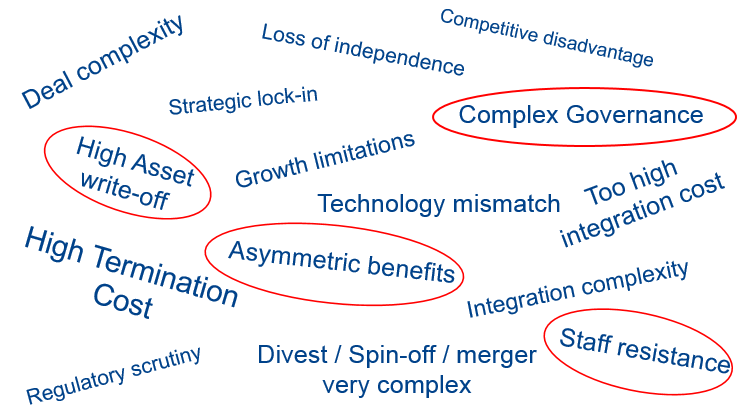 Tower Infrastructure – Typical Cash for infrastructure swap with log-term Opex commitments. Care must be taken to allow for Network Sharing and infrastructure termination. In general many of the above (with exception of IT or at least in a different context than RAN Sharing) potential outsourcing options can be highly synergetic with Network Sharing and should always be considered when negotiating a deal. and remember that any managed services that is assumed to be applicable in the Network Sharing strategy column will enable the upper end of the possible synergy potential estimated. 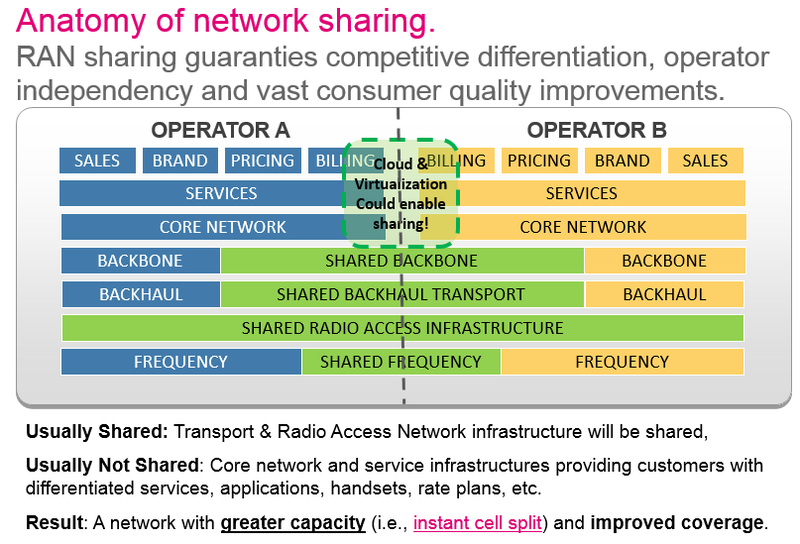 Having a deeper look at the original T-Mobile UK and Hutchinson UK 3G RAN Sharing deal is very instructive as it provides a view on what can be achieved when combining both best practices of network sharing and shared managed services (i.e., this is the story for The ABC of Network Sharing – Part II). Seriously consider Managed Services when it can be proven to provide at least 20% Opex synergies will be gained for apples to apples SLAs and KPIs (as compared to your insourced model). Do your Homework! It is bad Karma to implement Managed Services on an in-efficient organizational function or area that has not been optimized prior to outsourcing. Do your Homework (Part II)! Measure, Analyze and Understand your own relevant cost structure 100% before outsourcing! It is not by chance that Deutsche Telekom AG (DTAG) has been leading the Telco Operational Efficiency movement and have some of the most successful network sharing operations around. Since 2004 DTAG have had several (very) deep dives programs into their cost structure and defining detailed initiatives across every single operation as well as on its Group level. This has led to one of the most efficient Telco operations around in Western Europe & the US and with lots to learn from when it comes to managing your cost structure when faced with stagnating revenue growth and increasing cost pressure. In 2006, prior to another very big efficiency program was kicked off within DTAG, I was asked to take a very fundamental and extreme (but nevertheless realistic) look at all the European mobile operations technology cost structures and come back with how much Technology Opex could be pulled out of them (without hurting the business) within 3-4 years (or 2010). This analysis (7-8 years old by now) directly resulted in a lot of Network Sharing discussions across DTAGs operations in Europe. Ultimately this work led to a couple of successful Network Sharing engagements within the DTAG (i.e., T-Mobile) Western European footprint. It enabled some of the more in-efficient mobile operations to do a lot more than they could have done standalone and at least one today went from a number last to number 1. So YES … Network Sharing & Cost Structure Engineering can be used to leapfrog an in-efficient business and by that transforming an ugly duckling into what might be regarded as an approximation of a swan. (in this particular example I have in mind, I will refrain from calling it a beautiful swan … because it really isn’t … although the potential is certainly remain even more today). The observant reader till see that the order of things (or cost structure engineering) matters. As already said above, the golden rule of outsourcing and managed services is to first ensure you have optimized what can be done internally and then consider outsourcing. We found that first outsourcing network operations or establish a managed service relationship prior to a network sharing relationship was sub-optimal and actually might be hindering reaching the most optimal network sharing outcome (i.e., full RAN sharing or active sharing with joint planning & operations). Revenue Growth will eventually slow down and might even decline due to competitive climate, poor pricing management and regulatory pressures, A Truism for all markets … its just a matter of time. The Opex Growth is rarely in synch with the revenue slow down. This will result in margin or Ebitda pressure and eventually profitability decline. Revenue will eventually stagnate and likely even enter decline. Cost is entropy-like and will keep increasing. The technology refreshment cycles are not only getting shorter. These cycles imposes additional pressure on cash. Longer return on investment cycles results compared to the past. Paradoxical as the life-time of the Mobile Telecom Infrastructure is shorter than in the past. This vicious cycle requires the industry to leapfrog technology efficiency, driving demand for infrastructure sharing and business consolidation as well as new innovative business models (i.e., a topic for another Blog). The time Telco’s have to return on new technology investments is getting increasingly shorter. Cost saving measures are certain by nature. New Business & New (even Old) Revenue is by nature uncertain. Back to NETWORK SHARING WITH A VENGENCE! I have probably learned more from the network sharing deals that failed than the few ones that succeeded (in the sense of actually sharing something). I have work on sharing deals & concepts across across the world; in Western Europe, Central Eastern Europe, Asia and The USA under very different socio-economical conditions, financial expectations, strategic incentives, and very diverse business cycles. It is fair to say that over the time I have been engaged in Network Sharing Strategies and Operational Realities, I have come to the conclusion that the best or most efficient sharing strategy depends very much on where an operator’s business cycle is and the network’s infrastructure age. Greenfield: Initial phase of deployment with more than 80% of sites to be deployed. Young: Steady state with more than 80% of your sites already deployed. Mature: Just in front of major modernization of your infrastructure. The below Figure describes the three main cycles of network sharing. It should be noted that I have omitted the timing benefit aspects from the Rollout Phase (i.e., Greenfield) in the Figure above. The omission is on purpose. I believe (based on experience) that there are more likelihood of delay in deployment than obvious faster time-to-market. This is inherent in getting everything agreed as need to be agreed in a Greenfield Network Sharing Scenario. If time-to-market matters more than initial cost efficiency, then network sharing might not a very effective remedy. Once launch have been achieved and market entry secured, network sharing is an extremely good remedy in securing better economics in less attractive areas (i.e., typical rural and outer sub-urban areas). There are some obvious and very interesting games that can be played out with your competitor particular in the Rollout Phase … not all of them of the Altruistic Nature (to be kind). There can be a very good strategic arguments of not sharing economical attractive site locations depending on the particular business cycle and competitive climate of a given market. The value certain sites market potential could justify to not give them up for sharing. Particular if competitor time-to-market in those highly attractive areas gets delayed. This said there is hardly any reason for not sharing rural sites where the Ugly (Cost) Tail of low or no profitable sites are situated. Being able to share such low-no-profitability sites simply allow operators to re-focus cash on areas where it really matters. Sharing allows services can be offered in rural and under-develop areas at the lowest cost possible. Particular in emerging markets rural areas, where a fairly large part of the population will be living, the cost of deploying and operating sites will be a lot more expensive than in urban areas. Combined with rural areas substantially lower population density it follows that sites will be a lot harder to make positively return on investment within their useful lifetime. Total Cost of Ownership of rural sites are in many countries substantially higher than their urban equivalents. Low or No site profitability follows. In general it can be shown that between 40% to 50% of mature operators sites generates less than 10% of the revenue and are substantially more expensive to deploy and operate than urban sites. The ugly (cost) tail is a bit more “ugly” in mature western markets (i.e., 50+% of sites) than in emerging markets, as the customers in mature markets have higher coverage expectations in general. (Source: Western European market. Similar Ugly-tail curves observed in many emerging markets as well although the 10% breakpoint tend to be close to 40%). It is always recommend to analyze the most obvious strategic games that can be played out. Not only from your own perspective. More importantly, you need to have a comprehensive understanding of your competitors (and sharing partners) games and their most efficient path (which is not always synergetic or matching your own). Cost Structure Engineering should not only consider our own cost structure but also those of your competitors and partners. Sharing is something that is very fundamental to the human nature. Sharing is on the fundamental level the common use of a given resource, tangible as well as intangible. Sounds pretty nice! However, Sharing is rarely altruistic in nature i.e., lets be honest … why would you help a competitor to get stronger financially and have him spend his savings for customer acquisition … unless of course you achieve similar or preferably better benefits. It is a given that all sharing stakeholders should stand to benefit from the act of sharing. The more asymmetric perceived or tangible sharing benefits are the less stable will a sharing relationship be (or become over time if the benefit distribution should change significantly). Recipe for a successful sharing partnership is that the sharing partners both have a perception of a deal that offers reasonable symmetric benefits. It should be noted that perception of symmetric benefits does not mean per see that every saving or avoidance dollar of benefit is exactly the same for both partners. One stakeholder might get access to more coverage or capacity faster than in standalone. The other stakeholder might be able to more driven by budgetary concerns and sharing allows more extensive deployment than otherwise would have been possible within allocated budgets. Historical most network sharing deals have focused on RAN Sharing, comprising radio access network (RAN) site locations, related passive infrastructure (e.g., such as tower, cabinets, etc..) and various degrees of active sharing. Recent technology development such as software definable network (SDN), virtualization concepts (e.g., Network Function Virtualization, NFV) have made sharing of core network and value-add service platforms interesting as well (or at least more feasible). Another financially interesting industry trend is to spin-off an operators tower assets to 3rd party Tower Management Companies (TMC). The TMC pays upfront a cash equivalent of the value of the passive tower infrastructure to the Mobile Network Operator (MNO). The MNO then lease (i.e., Opex) back the tower assets from the TMC. Such tower asset deals provide the MNO with upfront cash and the TMC a long-term lease income from the MNO. In my opinion such Tower deals tend to be driven by MNOs short-term cash needs without much regard for longer term profitability and Ebitda (i.e., Revenue minus Opex) developments. With ever increasing demand for more and more bandwidth feeding our customers mobile internet consumption, fiber optical infrastructures have become a must have. Legacy copper-based fixed transport networks can no longer support such bandwidth demands. Over the next 10 years all Telco’s will face massive investments into fiber-optic networks to sustain the ever growing demand for bandwidth. Sharing such investments should be obvious and straightforward. In this area we also are faced with the choice of passive (Dark Fiber itself) as well as active (i.e., DWDM) infrastructure sharing. There are many consultants out there who evangelize network sharing as the only real cost reduction / saving measure left to the telecom industry. In Theory they are not wrong. The stories that will be told are almost too good to be true. Are you “desperate” for economical efficiency? You might then get very exited by the network sharing promise and forget that network sharing also has a cost side to it (i.e., usually forget and denial are fairly interchangeable here). Who to share with? (your equal, your better or your worse). What to share? (sites, passives, active, frequencies, new sites, old sites, towers, rooftops, organization, ,…). Where to share? (rural, sub-urban, urban, regional, all, etc..). How to share? (“the legal stuff”). CEOs agree with & endorse Network Sharing. Sharing Partners have similar perceived benefits (win-win feel). Focus on creating a better network for less and with better time-to-market.. Both parties share a similar end-goal and have a similar strategic outlook. While it seems obvious it is often forgotten that Network Sharing is a very-long term engagement (“for Life!”) and like in any other relationship (particular the JV kind) Do consider that a break-up can happen … so be prepared (i.e., “legal stuff”). Compared to 14 – 15 years ago, Technology pretty much support Network Sharing in all its flavors and is no longer a real show-stopper for engaging with another operator to share network and ripe of (eventually) the financial benefits of such a relationship. References on the technical options for network sharing can be found in the 3GPP TR 3GPP TS 22.951 (“Service Aspects and Requirements for network sharing”) and 123.251 (“Network Sharing; Architecture and Functional Description”). Obviously, today 3GPP support for network sharing runs through most of the 3GPP technical requirements and specification documents. Technology is not a show-stopper for Network Sharing. The Economics might be! Before committing man power to a network sharing deal, there are a couple of pretty basic “litmus tests” to be done to see whether the economic savings being promised make sense. 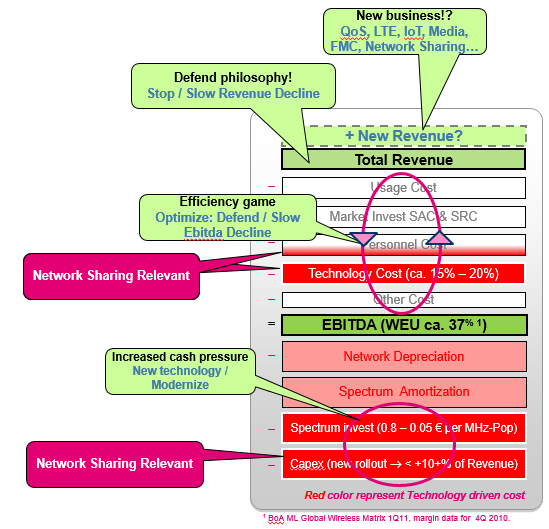 First understand your own cost structure (i.e., Capex, Opex, Cash and Revenues) and in particular where Network Sharing will make an impact – positive as well as negative. I am more often that not, surprised how few Executives and Senior Managers really understand their own company’s cost structure. Thus they are not able to quickly spot un-realistic financial & operational promises made. What is the Total Technology Opex (Network & IT) share out of the Total Corporate Opex? What is the Total Network Opex out of Total Technology Opex? What is the Total Radio Access Network (RAN) Opex out of the Total Network Opex? Out of the Total RAN Opex how much relates to sites including Operations & Maintenance? In general, I would expect the following answers to the above questions based on many of mobile operator cost structure analysis across many different markets (from mature to very emerging, from Western Europe, Central Eastern & Southern Europe, to US and Asia-Pacific). Technology Opex is 20% to 25% of Total Corporate Opex defined as “Revenue-minus-Ebitda”(depends a little on degree of leased lines & diesel generator dependence). RAN related Opex should be between 50% to 80% of the Network Opex. Of course here it is important to understand that not all of this Opex might be impacted by Network Sharing or at least the impact would depend on the Network Sharing model chosen (e.g., active versus passive). Lets assume that a given RAN network sharing scenario provides a 35% saving on Total RAN Opex, that would be 35% (RAN Saving) x 60% (RAN Opex) x 75% (Network Opex) x 25% (Technology Opex) which yields a total network sharing saving of 4% on the Corporate Opex. (with E1 and E2 represents Ebitda before and after the relative Opex saving x, m1 is the margin before the Opex saving, assuming that Revenue remains unchanged after Opex saving has been realized). From the above we see that when the margin is exactly 50% (i.e., fairly un-usual phenomenon for most mature markets), a saving in Opex corresponds directly to an identical relative saving in Ebitda. When the margin is below 50% the relative impact on Ebitda is higher than the relative saving on Opex. If your margin was 40% prior to a realized Opex saving of 5%, one would expect the margin (or Ebitda) saving to be 1.5x that saving or 7.5%. In general I would expect up-to 35% Opex saving on relevant technology cost structure from network sharing on established networks. If much more saving is claimed, we should get skeptical of the analysis and certainly not take it on face value. It is not un-usual to see Network Sharing contributing as much as 20% saving (and avoidance on run-rate) on the overall Network Opex (ignoring IT Opex here!). Why not 50% saving (or avoidance)? You may ask! But only once please! After all we are taking 2 RAN networks and migrating them into 1 network … surely that should result in at 50% saving (i.e., always on relevant cost structure). 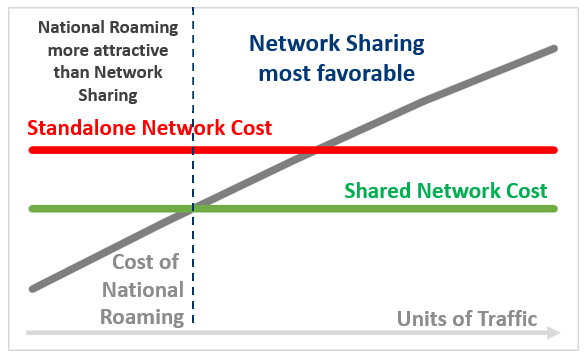 First of all, not all relevant (to cellular sites) cost structure is in general relevant to network sharing. Think here about energy consumption and transport solutions as the most obvious examples. Further, landlords are not likely to allow you to directly share existing site locations, and thus site lease cost with another operator without asking for an increased lease (i.e., 20% to 40% is not un-heard of). Existing lease contracts might need to be opened up to allow sharing, terms & conditions will likely need to be re-negotiated, etc.. in the end site lease savings are achievable but these will not translate into a 50% saving. WARNING! 50% saving claims as a result of Network Sharing are not to be taken at face value! Another interesting effect is that more shared sites will eventually result compared to the standalone number of sites. In other words, the shared network will have sites than either of the two networks standalone (and hopefully less than the combined amount of sites prior to sharing & consolidation). The reason for this is that the two sharing parties networks rarely are completely symmetric when it comes to coverage. Thus the shared network that will be somewhat bigger than compared to the standalone networks and thus safeguard the customer experience and hopefully the revenue in a post-merged network scenario. If the ultimate shared network has been planned & optimized properly, both parties customers will experience an increased network quality in terms of coverage and capacity (i.e., speed). The Shared Network should always provide a better network customer experience than each standalone networks. I have experienced Executives argue (usually post-deal obviously!) that it is not possible to remove sites, as any site removed will destroy customer experience. Let me be clear, If the shared network is planned & optimized according with best practices the shared network will deliver a substantial better network experience to the combined customer base than the respective standalone networks. 45% to 70% for RAN. The RAN Opex for markets without energy distribution challenges, i.e., mature & reliable energy delivery grid) is split in (a) ca. 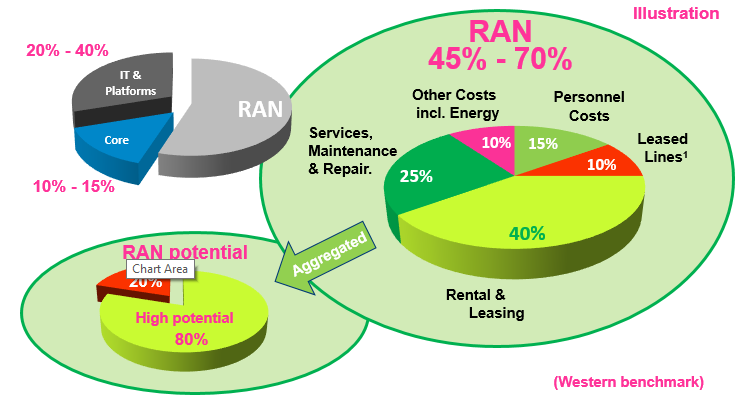 40% (i.e., of the RAN Opex) for Rental & Leasing which is clearly addressable by Network Sharing, (b) ca. 25% in Services including Maintenance & Repair of which at least the non-Telco part is easily addressable by Network Sharing, (c) ca. 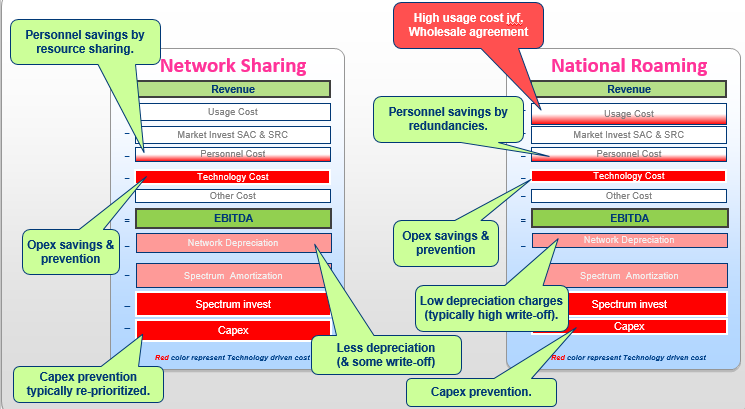 15% Personnel Cost also addressable by Network Sharing, (d) 10% Leased Lines (typical backhaul connectivity) is less dependent on Network Sharing although bandwidth volume discounts might be achievable by sharing connectivity to a shared site and finally (e) Energy & other Opex costs would in general not be impacted substantially by Network Sharing. Note that for markets with a high share of diesel generators and fuel logistics, the share of Energy cost within the RAN Opex cost category will be substantially larger than depicted here. Power sharing in mature markets with high electrification rates can offer synergies on energy via applicable volume discounts though would require shared metering (which might not always be particular well appreciated by power companies). 80% of the total RAN Opex can be positively impacted (i.e., reduced) by network sharing. Above cost structure illustration also explain why I rarely get very exited about sharing measures in Core Network Domain (i.e., spend too much time in the past to explain that while NG Core Network might save 50% of relevant cost it really was not very impressive in absolute terms and efforts was better spend on more substantial cost structure elements). Assume you can save 50% (which is a bit on the wild side today) on Core Network Opex (even Capex is in proportion to RAN fairly smallish). That 50% saving on Core translates into maybe maximum 5% of the Network Opex as opposed to RAN’s 15% – 20%. Sharing Core Network resources with another party does require substantially more overhead management and supervision than even fairly aggressive RAN sharing scenarios (with substantial active sharing). This said, I believe that there are some internal efficiency measures to Telco Groups (with superior interconnection) and very interesting new business models out there that do provide core network & computing infrastructure as a service to Telco’s (and in principle allow multiple Telco’s to share the core network platforms and resources. My 2012 presentation on Ultra-Efficient Network Factory: Network Sharing & other means to leapfrog operator efficiencies. illustrates how such business models might work out. The first describes in largely generic terms how virtualization (e.g., NFV) and cloud-based technologies could be exploited. 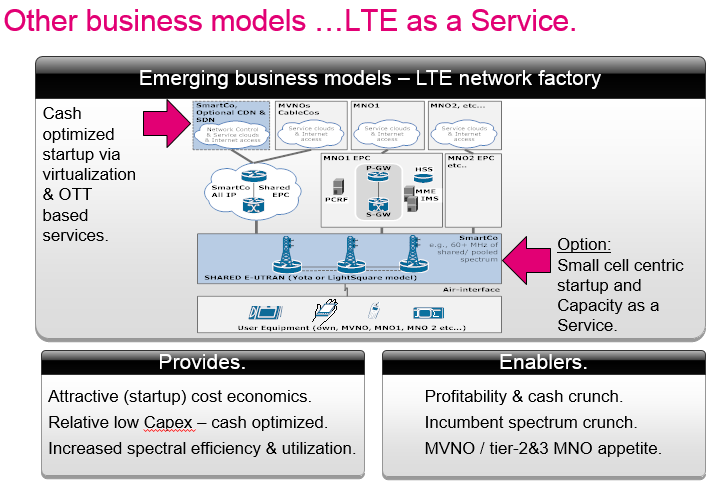 The LTE-as-a-Service (could be UMTS-as-a-Service as well of course) is more operator specific. The verdict is still out there whether truly new business models can provide meaningful economics for customer networks and business. In the longer run, I am fairly convinced, that scale and expected massive improvements in connectivity in-countries and between-countries will make these business models economical interesting for many tier-2, tier-3 and Generation-Z businesses. BUT BUT … WHAT ABOUT CAPEX? From a Network Sharing perspective Capex synergies or Capex avoidance are particular interesting at the beginning of a network rollout (i.e., Rollout Phase) as well as at the end of the Steady State where technology refreshment is required (i.e., the Modernization Phase). Obviously, in a site deployment heavy scenario (e.g., start-ups) sharing the materials and construction cost of greenfield tower or rooftop (in as much as it can be shared) will dramatically lower the capital cost of deployment. In particular as you and your competitor(s) would likely want to cover pretty much the same places and thus sharing does become very compelling and a rational choice. Unless its more attractive to block your competitor from gaining access to interesting locations. Irrespective, between 40% to 50% of an operators sites will only generate up-to 10% of the turnover. Those ugly-cost-tail sites will typically be in rural areas (including forests) and also on average be more costly to deploy and operate than sites in urban areas and along major roads. Sharing 40% – 50% of sites, also known as the ugly-cost-tail sites, should really be a no brainer! Depending on the market, the country particulars, and whether we look at emerging or mature markets there might be more or less Tower sites versus rooftops. Rooftops are less obvious passive sharing candidates, while Towers obviously are almost perfect passive sharing candidates provided the linked budget for the coverage can be maintained post-sharing. Active sharing does make rooftop sharing more interesting and might reduce the tower design specifications and thus optimize Capex further in a deployment scenario. As operators faces RAN modernization pressures it can Capex-wise become very interesting to discuss active as well as passive sharing with a competitor in the same situation. There are joint-procurement benefits to be gained as well as site consolidation scenarios that will offer better long-term Opex trends. Particular T-Mobile and Hutchinson in the UK (and T-Mobile and Orange as well in UK and beyond) have championed this approach reporting very substantial sourcing Capex synergies by sharing procurements. Note network sharing and sharing sourcing in a modernization scenario does not force operators to engage in full active network sharing. However, it is a pre-requisite that there is an agreement on the infrastructure supplier(s). Network Sharing triggered by modernization requirements is primarily interesting (again Capex wise) if part of electronics and ancillary can be shared (i.e., active sharing). Suppliers match is an obviously must for optimum benefits. Otherwise the economical benefits will be weighted towards Opex if a sizable amount of sites can be phased out as a result of site consolidation. The above Figure provides an overview of the most interesting components of Network Sharing. It should be noted that Capex prevention is in particular relevant to (1) The Rollout Phase and (2) The Modernization Phase. Opex prevention is always applicable throughout the main 3 stages Network Sharing Attractiveness Cycles. In general the Regulatory Complexity tend to be higher for Active Sharing Scenarios and less problematic for Passive Sharing Scenarios. In general Regulatory Authorities would (or should) encourage & incentivize passive site sharing ensuring that an optimum site infrastructure (i.e., number of towers & rooftops) is being built out (in greenfield markets) or consolidated (in established / mature markets). Even today it is not un-usual to find several towers, each occupied with a single operator, next to each other or within hundred of meters distance. NETWORK SHARING DOES NOT COME FOR FREE! What does it cost me to network share? The amount of re-structuring or termination cost that will be incurred before Network Sharing benefits can be realized will depend a lot on which part of the Network Sharing Cycle. (1) The Rollout Phase in which case re-structuring cost is likely to be minimum as there is little or nothing to restructure. Further, also in this case write-off of existing investments and assets would likewise be very small or non-existent pending on how far into the rollout the business would be. What might complicate matters are whether sourcing contracts needs to be changed or cancelled and thus result in possible penalty costs. In any event being able to deploy together the network from the beginning does (in theory) result in the least deployment complexity and best deployment economics. However, getting to the point of agreeing to shared deployment (i.e., which also requires a reasonable common site grid) might be a long and bumpy road. Ultimately, launch timing will be critical to whether two operators can agree on all the bits and pieces in time not to endanger targeted launch. Little restructuring & termination cost expected. Little to no infrastructure write-offs. Little to no risk of contract termination penalties. “Normal” network deployment project (though can be messed up by too many cooks syndrome). (2) The Steady State Phase, where a substantial part of the networks have been rollout out, tend to be the most complex and costly phase to engage in Network Sharing passive and of course active sharing. A substantial amount of site leases would need to be broken, terminated or re-structured to allow for network sharing. In all cases either penalties or lease increases are likely to result. Infrastructure supplier contracts, typically maintenance & operations agreements, might likewise be terminated or changed substantially. Same holds for leased transmission. Write-off can be very substantial in this phase as relative new sites might be terminated, new radio equipment might become redundant or phased-out, etc If one or both sharing partners are in this phase of the business & network cycle the chance of a network sharing agreement is low. However, if a substantial amount of both parties site locations will be used to enhance the resulting network and a substantial part of the active equipment will be re-used and contracts expanded then sharing tends to be going ahead. A good example of this is in the UK with Vodafone and O2 site sharing agreement with the aim to leapfrog number of sites to match that of EE (Orange + T-Mobile UK JV) for improved customer experience and remain competitive with the EE network. Very high restructuring & termination cost expected. None or little Capex synergies. Very high termination penalties incl. site lease termination. Medium to long-term network quality & optimization issues. (3) Once operators approaches the Modernization Phase more aggressive network sharing scenarios can be considered as the including joint sourcing and infrastructure procurement (e.g., a la T-Mobile UK and Hutchinson in UK). At this stage typically the remainder of the site leases term will be lower and penalties due to lease termination as a result lower as well. Furthermore, at this point in time little (or at least substantially lower than in the steady state phase) residual value should remain in the active and also passive infrastructure. The Modernization Phase is a very opportune moment to consider network sharing, passive as well as active, resulting in both substantial Capex avoidance and of course very attractive Opex savings mitigating a stagnating or declining topline as well as de-risking future loss of profitability. Relative moderate restructuring & termination cost expected. Lower risk of contract termination penalties. 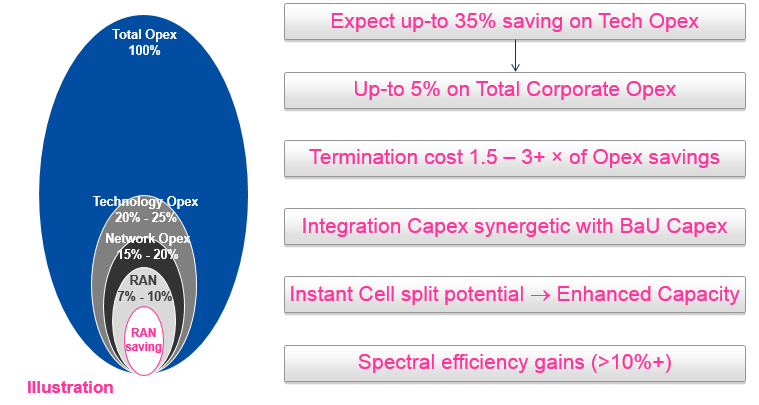 Instant cell splits and cost-efficient provision of network capacity. More aggressive network optimization –> better network. 1.5 to 3+ times the estimated Opex savings – use the higher multiple in the Steady State Phase and the Lower for Modernization Phase. Consolidation Capex will often be partly synergetic with Business-as-Usual (BaU) Capex and should not be fully considered (typically between 25% to 50% of consolidation Capex can be mapped to BaU Capex). Write-offs should be considered and will be the most pain-full to cope with in the Steady State Phase. NATIONAL ROAMING AS AN ALTERNATIVE TO NETWORK SHARING. A National Roaming agreement will save network investments and the resulting technology Opex. So in terms of avoiding technology cost that’s an easy one. Of course from a Profit & Loss (P&L) perspective I am replacing my technology Opex and Capex with wholesale cost somewhere else in my P&L. Whether National Roaming is attractive or not will depend a lot of anticipated traffic and of course the wholesale rate the hosting network will charge for the national roaming service. Hutchinson in UK (as well in other markets) had for many years a GSM national roaming agreement with Orange UK, that allowed its customers basic services outside its UMTS coverage footprint. 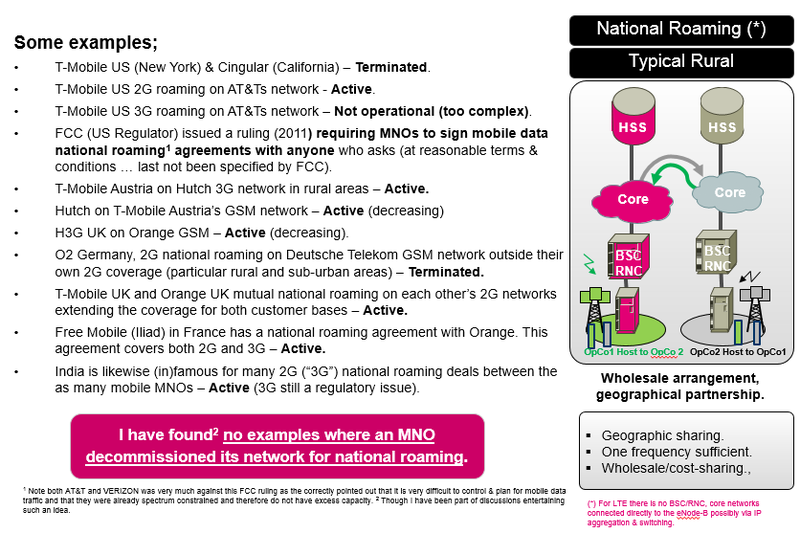 In Austria for example, Hutchinson (i.e., 3 Austria) provide their customers with GSM national roaming services on T-Mobile Austria’s 2G network (i.e., where 3 Austria don’t cover with their own 3G) and T-Mobile Austria has 3G national roaming arrangement with Hutchinson in areas that they do not cover with 3G. There are plenty of examples on National Roaming which in principle can provide similar benefits to infrastructure sharing by avoidance of Capex & Opex that is being replaced by the cost associated with the traffic on the hosting network.The Hosting MNO gets wholesale revenue from the national roaming traffic which the Host supports in low-traffic areas or on a under-utilized network. National roaming agreements or relationships tends to be of temporary nature. It should be noted that National Roaming is defined in an area were 1-Party The Host has network coverage (with excess capacity) and another operator (i.e., The Roamer or The Guest) has no network coverage but has a desire to offer its customers service in that particular area. In general only the host’s HPLMN is been broadcasted on the national roaming network. However, with Multi-Operator Core Network (MOCN) feature it is possible to present the national roamer with the experience of his own network provided the roamers terminal equipment supports MOCN (i.e., Release 8 & later terminal equipment will support this feature). In many Network Sharing scenarios both parties have existing and overlapping networks and would like to consolidate their networks to one shared network without loosing service quality. The reduction in site locations provide the economical benefits of network sharing. Throughout the shared network both operators will radiate their respective HPLMNs and the shared network will be completely transparent to their respective customer bases. While having been part of several discussions to shut down one networks in geographical areas of a market and move customers to a host overlapping (or better) network via a national roaming agreement, I am not aware of mobile operators which have actually gone down this path. Regulatory and from a spectrum safeguard perspective it might be a better approach to commission both parties frequencies on the same network infrastructure and make use of for example the MOCN feature that allows full customer transparency (at least for Release 8 and later terminals). National Roaming is fully standardized and a well proven arrangement in many markets around the world. One does need to be a bit careful with how the national roaming areas are defined/implemented and also how customers move back and forth from a national roaming area (and technology) to home area (and technology). I have seen national roaming arrangements not being implemented because the dynamics was too complex to manage. The “cleaner” the national roaming area is the simpler does the on-off national roaming dynamics become. With “Clean” is mean keep the number of boundaries between own and national roaming network low, go for contiguous areas rather than many islands, avoid different technology coverage overlap (i.e., area with GSM coverage, it should avoided to do UMTS national roaming), etc.. Note you can engineer a “dirty” national roaming scenario of course. However, those tend to be fairly complex and customer experience management tends to be sub-optimal. Network Sharing and National Roaming are from a P&L perspective pretty similar in the efficiency and savings potentials. The biggest difference really is in the Usage Based cost item where a National Roaming would incur higher cost than compared to a Network Sharing arrangement. Network Sharing in rural area addressing 500 sites. Terminate 500 sites in rural area and make use of National Roaming Agreement. What we are really interested in, is to understand when Network Sharing provides better economics than National Roaming and of course vice versa. National Roaming can be attractive for relative low traffic scenarios or in case were product of traffic units and national roaming unit cost remains manageable and lower than the Shared Network Cost. The above illustration ignores the write-off and termination charges that might result from terminating a given number of sites in a region and then migrate traffic to a national roaming network (note I have not seen any examples of such scenarios in my studies). The termination cost or restructuring cost, including write-off of existing telecom assets (i.e., radio nodes, passive site solutions, transmission, aggregation nodes, etc….) is likely to be a substantially financial burden to National Roaming Business Case in an area with existing telecom infrastructure. Certainly above and beyond that of a Network Sharing scenario where assets are being re-used and restructuring cost might be partially shared between the sharing partners. Obviously, if National Roaming is established in an area that has no network coverage, restructuring and termination cost is not an issue and Network TCO will clearly be avoided, Albeit the above economical logic and P&L trade-offs on cost still applies. National Roaming can be an interesting economical alternative, at least temporarily, to Network Sharing or establishing new coverage in an area with established network operators. However, National Roaming agreements are usually of temporary nature as establishing own coverage either standalone or via Network Sharing eventually will be a better economical and strategic choice than continuing with the national roaming agreement. SHARING BY TOWER COMPANY (TOWERCO). There is a school of thought, within the Telecommunications Industry, that very much promotes the idea of relying on Tower Companies (Towerco) to provide and manage passive telecom site infrastructure. The mobile operator leases space from the Towerco on the tower (or in some instances a rooftop) for antennas, radio units and possible microwave dishes. Also the lease would include some real estate space around the tower site location for the telecom racks and ancillary equipment. In the last 10 years many operators have sold off their tower assets to Tower companies that then lease those back to the mobile operator. In most Towerco deals, Mobile Operators are trading off up-front cash for long-term lease commitments. With the danger of generalizing, Towerco deals made by operators in my opinion have a bit the nature and philosophy of “The little boy peeing in his trousers on a cold winter day, it will warm him for a short while, in the long run he will freeze much more after the act”. Let us also be clear that the business down the road will not care about a brilliant tower deal (done in the past) if it pressures their Ebitda and Site Lease cost. In general the Tower company will try (should be incented) to increase the tower tenancy (i.e., having more tenants per tower). Pending on the lease contract the Towerco might (should!) provide the mobile operator lease discount as more tenants are added to a given tower infrastructure. Towerco versus Network Sharing is obviously a Opex versus Capex trade-off. Anyway, lets look at a simple total-cost-of-ownership example that allows us to understand better when one strategy could be better than the other. From the above very simple and high level per tower total-cost-of-ownership model its clear that a Towerco would have some challenges in matching the economics of the Shared Network. A Mobile Operator would most likely (in above example) be better of commencing on a simple tower sharing model (assuming a sharing partner is available and not engaging with another Towerco) rather than leasing towers from a Towerco. The above economics is ca. 600 US$ TCO per month (2-sharing scenario) compared to ca. 1,100 (2-tenant scenario). 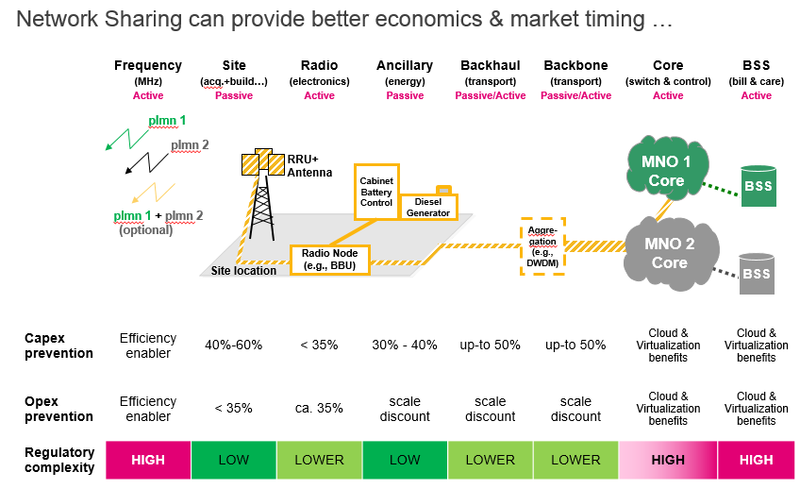 Actually, unless the Towerco is able to (a) increase occupancy beyond 2, (b) reduce its productions cost well below what the mobile operators would be (without sacrificing quality too much), and (c) at a sufficient low margin, it is difficult to see how a Towerco can provide a Tower solution at better economics than conventional network shared tower. This said it should also be clear that the devil will be in the details and there are various P&L and financial engineering options available to mobile operators and Towercos that will improve on the Towerco model. In terms of discounted cash flow and NPV analysis of the cash flows over the full useful life period the Network Sharing model (2-parties) and Towerco lease model with 2-tenants can be made fairly similar in terms of value. However, for 2-tenant versus 2-party sharing, the Ebitda tends to be in favor of network sharing. Operator business failure or consolidation. Future Network Sharing and subsequent lease termination. Contract penalties for Towerco non-performance, etc.. Given the fairly large inherent risk (to Towerco business models) of operator consolidation in mature markets, with more than 3 mobile operators, there would be a “wicked” logic in trying to mitigate consolidation scenarios with costly breakaway clauses and higher margins. From all the above it should be evident that for mobile operators with considerable tower portfolios and also sharing ambitions, it is far better to (First) Consolidate & optimize their tower portfolios, ensuring minimum 2 tenants on each tower and then (Second) spin-off (when the cash is really needed) the optimized tower portfolio to a Towerco ensuring that the long-term lease is tenant & Ebitda optimized (as that really is going to be any mobile operations biggest longer term headache as markets starts to saturate). SUMMARY OF PART I – THE FUNDAMENTALS. Network Sharing provides one of the biggest financial efficiency levers available to mobile network operator. Maybe apart from reducing market invest… but that is obviously not really a sustainable medium-long-term strategy. In aggressive network sharing scenarios Opex savings in the order of 35% is achievable as well as future Opex avoidance in the run-rate. Depending on the Network Sharing Scenario substantial Capex can be avoided by sharing the infrastructure built-out (i.e., The Rollout Phase) and likewise in the Modernization Phase. Both allows for very comprehensive sharing of both passive and active infrastructure and the associated capital expenses. Both National Roaming and Sharing via Towerco can be interesting concepts and if engineered well (particular financially) can provide similar benefits as sharing (active as well as passive, respectively). Particular in cash constrained scenarios (or where operators see an extraordinary business risk and want to minimize cash exposure) both options can be attractive. Long-term National Roaming is particular attractive in areas where an operator have no coverage and has little strategic importance. In case an area is strategically important, national roaming can act as a time-bridge until presence has been secure possibly via Network Sharing (if competitor is willing). Sharing via Towerco can also be an option when two parties are having trust issues. Having a 3rd party facilitating the sharing is then an option. In my opinion National Roaming & Sharing via Towerco rarely as Ebitda efficient as conventional Network Sharing. Finally! Why should you stay away from Network Sharing? This question is important to answer as well as why you should (which always seems initially the easiest). Either to indeed NOT to go down the path of network sharing or at the very least ensure that point of concerns and possible blocking points have been though roughly considered and checked of. I would like to thank many colleagues for support and Network Sharing discussions over the past 13 years. However, in particular I owe a lot to David Haszeldine (Deutsche Telekom) for his insights and thoughts. David has been my true brother-in-arms throughout my Deutsche Telekom years and on our many Network Sharing experiences we have had around the world. I have had many & great discussions with David on the ins-and-outs of Network Sharing … Not sure we cracked it all? … but pretty sure we are at the forefront of understanding what Network Sharing can be and also what it most definitely cannot do for a Mobile Operator. Of course similar to all the people who have left comments on my public presentations and gotten in contact with me on this very exiting and by no way near exhausted topic of how to share networks. The term the “Ugly Tail” as referring to rural and low-profitability sites present in all networks should really be attributed to Fergal Kelly (now CTO of Vodafone Ireland) from a meeting quiet a few years ago. The term is too good not to borrow … Thanks Fergal! This story is PART I and as such it obviously would indicate that another Part is on the way … PART II – “Network Sharing – That was then, this is now” will be on the many projects I have worked on in my professional career and lessons learned (all available in the public domain of course). Here obviously providing a comparison with the original ambition level and plans with the reality is going to be cool (and in some instances painful as well). PART III – “The Tools” will describe the arsenal of tools and models that I have developed over the last 13 years and used extensively on many projects.